* Dry Shave Gel is meant to be a three-in-one product: preshave, shave, and aftershave. * Following the instructions, you apply to dry skin and wait 30 seconds. The gel does moisturize your skin. * The smell is a chemical mix of cinnamon, citrus, and wood that is kind of refreshing. * While shaving, I found it to be similar when I use a standard shave cream without a preshave. It wasn’t bad, it just wasn’t as good as my normal setup. * After shaving, you reapply the gel as a soother. This was the weakest of the steps as it burns a bit, has a sticky feel that you don’t want to have on your skin, and the smell isn’t the most pleasant after a while. Summary: Dry shave gel is a great idea for a product and this would work well for some people in certain situations. If you do not have sensitive skin, shave in front of the mirror (not in the shower), and don’t mind sticky residue. I tested this product for about two weeks and eventually got it to work as part of a routine by modifying the steps. After applying the gel as preshave, wait 60 seconds for the full effect of moisturizing. Make sure you use a fresh or sharp blade and MOISTEN the blade. When it says dry shave gel, it mean no water on skin, NOT no water on the blade. Yes, I know this sounds obvious, but this isn’t made clear in the directions and my first experience was not that pleasant (I thought the product was made for environments where there wasn’t running water/outdoors). Use a separate aftershave splash or balm, the gel dries and kind of cakes on your skin, feeling a bit gummy. I tried using less and less but that didn’t help. This may sound like a negative review but it isn’t. This is a good product if it fits your needs: traveling and want to carry fewer skin products (though the tube is 4 Oz so it’s not TSA-friendly), you don’t have sensitive skin, or you are trying to conserve water. The compromises made in making this a Dry Shave Gel makes it something I won’t be adding to my normal shave routine, though. 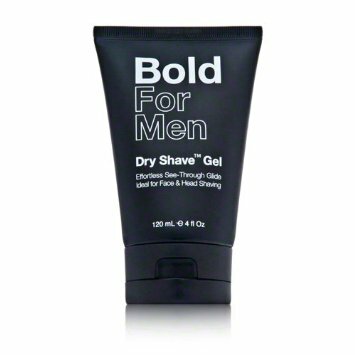 Bold Dry Shave Gel for Men is available through Amazon.com. Disclaimer: Item purchased for review – no disclaimer need. No financial compensation is received for this review or any others. All opinions are mine. Image courtesy of Amazon.